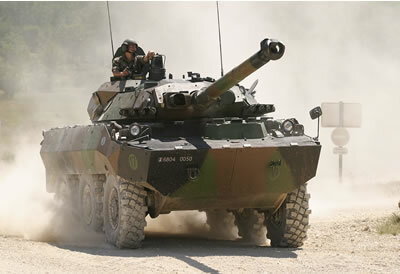 The French 6×6 AMX-10RC is a reconnaissance vehicle of the French Army. Some publications refer to the vehicle as a tank destroyer and thou the 105mm main gun was capable of taking on medium battle tanks such as the T-55 and T-62, it is not capable of taking on the more advanced main battle tanks like the T-64, T-72 and T-80. However the vehicle can fire HEAT & HE rounds (as well as APFSDS) which gives it a successful fire support role for troops on the ground. The main 105mm main gun, despite common miss believe is not a licence manufactured copy of the famous British L7. Thou France is a member of NATO, its not a full-time member and therefore not fully compliant of STANAG’s, that is it cant fire 105mm ammo used by the L7 (which is used by a multitude of other members), so can only fire French built rounds. It is equipped with a coaxial 7.62mm MG. 4000 x 7.62mm and 38 105mm rounds are carried. The first prototype was completed in 1971, with first deliveries to the French Army in 1978 as a replacement to the Panhard EBR 8×8 armoured car. The vehicle uses a 4 man crew. Driver sits front left in the hull, with the loader on the left in the turret and the gunner with vehicle commander on the right. The vehicle has an NBC protection system and 2 banks of 4 grenade launchers for creating smoke screens. Reconnaissance vehicles require speed and mobility. This means light armour (aluminium construction) and the addition of extra bells and whistles such as water jets to propel it in the water, which the vehicle has. It uses a 280hp Baudouin Model 6F 11 SRX diesel engine. It has a hydro gas suspension system which can raise the vehicle, so as to adjust its ground clearance. The vehicle offers a top road speed of 85km/hr with a top operational range of 1000km. The vehicle has a combat weight of 15.8tons, giving a power to weight ratio of 16.45hp/ton. France – Over 300 vehicles were delivered by 1987. It went on to serve during the 1991 Gulf War and various peacekeeping missions through out the Balkans. Qatar – 12 vehicles sold. They operated the AMX-30 tank during the 1991 Gulf War, so possibly operated the vehicle during the conflict too. 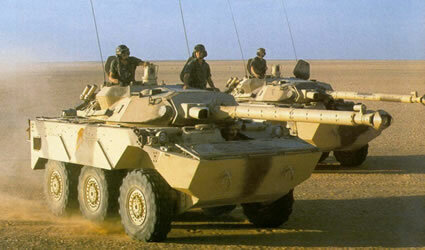 Morocco – 108 vehicles operated, these lack the amphibious capabilities of the French vehicles. Nexter (the state owned company to succeed Giat) have developed a new upgrade package, which is being added to French vehicles. · Integration of new generation radio sets. · Integration of an automatic and voice listening system. · New suspension control system with ground clearance adjustment system. · Enhanced capabilities of gearboxes, transfer boxes and side boxes. · Wide-band smoke screen (GALIX close-defence system). · Additional protection by means of add-on armour. · Protection of optics against laser effects. · Multispectral stealth kit (KDFM). · Ultra-rapid explosion/fire detection and suppression system. · Integration of a thermal imager. · Tools and diagnosis and maintenance means.